ADSS Global is the top provider of Sage 300 business intelligence packages. We provide planning, design, customization and on going support for your Sage 300 business intelligence needs. ADSS Global is the top reseller of Sage 300 software in North America and has been year over year. Our mission is to provide clients with Sage 300 business intelligence packages, eBusiness solutions, Customer Relationship Management (CRM), business accounting software solutions and analytical software. This will enable clients to leverage their investment in technology to enhance long-term equity value and maintain a strong competitive advantage to compete in the new digital Economy. As an alternative to Sage Business Intelligence, e-Analytics Portal is the unique web, simple and ready to use sales & profit analytic application that enables you to analyze the details of your business, identify problems sooner and focus your attention on the most profitable aspects of your business in order to drive sales & profit performance. Ability to track how your products are selling across different periods by product class, state and territory. Rank your customers, products, territories. Reduce the time your analysts spend gathering data. Identify your most profitable customers, products and classes. Perform drag and drop, ad hoc analysis on any sales data using Excel® Pivot tables. 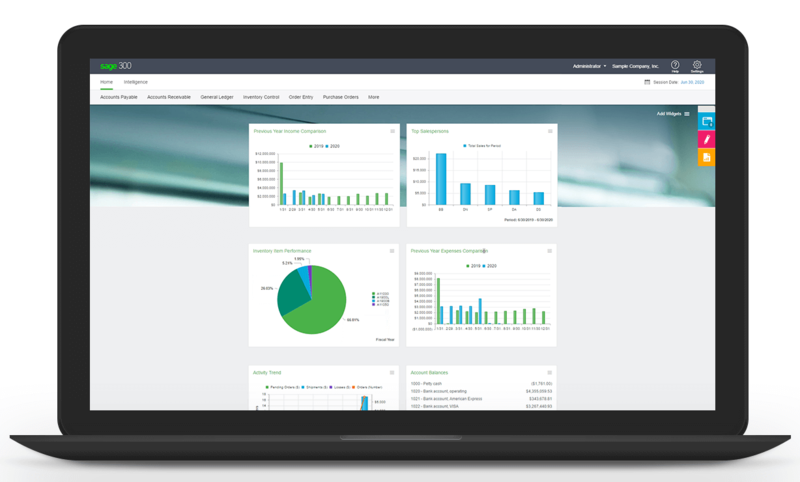 Click below to get in touch and ask us your questions or request a demo of Sage 300 Business Intelligence or e-Analytics Portal. Or click below to leave a message and one of our consultants will follow up. Get our popular Sage customer newsletters delivered to your inbox.